Proper hair care keeps the hair young and bouncy in old age too. Hair gets grey and thin by the time but you can retain their younger look even if you are in 40s or 50s of age. At the time of birth, we have about 100,000-150,000 hair follicles. We can’t produce more than that figure. As time passes and we age, hair gets thinner and greyish due to follicles’ mass shrinking. § Gentle massage to your scalp for 15 to 20 minutes once a day and usage of good products constituted by quality ingredients increases hair growth. § As we gets older, the iron deficiency in our body can lead to hair thinning. So increase use of iron-rich foods (chicken, egg yolk, beef, potatoes with skin, watermelon, spinach, green peas, citrus fruits, fish, cereals, leafy green vegetables and dry fruits) in your meal. Iron is necessary for growth and a sound body should have 60 mcg/dL to 170 mcg/dL of iron. § Avoid hair styles that tightens the hair and can cause hair breakage like tight pony tail, tight braids (French double braid) and hair buns. Never style your hair on daily basis. Let hair remain free for most of time and choose loose & casual hairstyles in routine. § Nourish your hair like you do your skin. Hair treatments thickens the hair. Moreover, experts suggests daily hair conditioning and masks to keep the hair strong throughout the life. 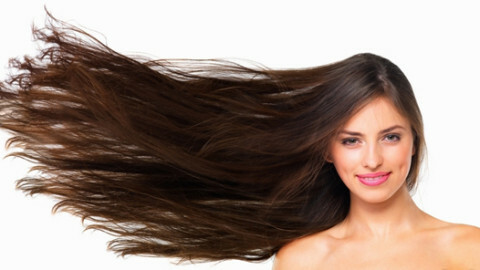 length for a woman’s hair is halfway between shoulders and waist. § Hair colour gives one either a younger look or an older look. Find out your skin tone before deciding on the right hair color. Be careful and select hair dye which suits you best. § Use good quality hair products to help brightening grey hair. White hair are more at risk to sun damage. So choose sun products for your hair that contain UV filters. § Consult your hair stylist in order to seek help for gaining thicker and shinier hair. Open secrets for Healthy HairHow to choose the perfect shade for your hair?